Welcome to last-minute gift season, the most wonderful time of the year. There comes a time in every knitter's life when it occurs to you to make gifts for people instead of buying them trinkets at the mall. Oh yes, you will feel like a genius, a modern day Leonardo DaVinci; talented, versatile and original. You may even be the sort of person who makes a list of the people in your life and the gifts you want to knit for them. Utilitarian objects for the men in subdued colors, crazy accessories for the young ladies, lacy shawls for those women with more sense. You'll never have to battle holiday crowds at the mall again. As time passes, you will find yourself with a nagging sensation in the far corners of your mind. No matter how much time you have invested in gift knitting, you still have a long ways to go. Maybe you have not yet cast on for the figgly monster-sized project lined up next. You will hear a tiny voice saying, "You don't have enough time to finish all of this." Or perhaps, "If you don't tell anyone about the pains in your hand/fingers/wrist/arms/elbows, there is nothing serious to be concerned about." Your desire to produce handmade presents is overwhelming. You will be tempted to forgo sleep to get all of your projects completed in time. Fear not intrepid artisans. I have a project for you that takes five minutes, and everyone who sees it will say to you, "How cool! You made it?" After all, isn't that the reaction we really want when knitting for others? I present to you felted beads. You can make them perfectly matching or vary the sizes and colors. They can look like wooly marbles or rough pebbles. You can use them to adorn hats and scarves, or in place of buttons or fringe. You can make them into jewelry. Go wild. 1. 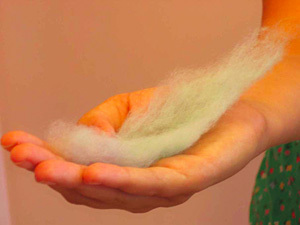 Start by taking a small amount of wool into your hands. Tease the roving a bit to make it fluffy. The amount depends on the size bead you wish to make. 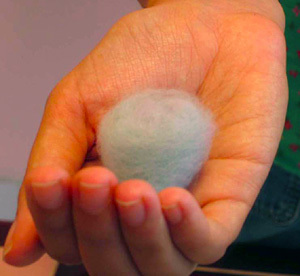 The roving will shrink about half in size when felting, so keep that in mind when starting. TIP: Always pull roving apart, never use scissors. 2. 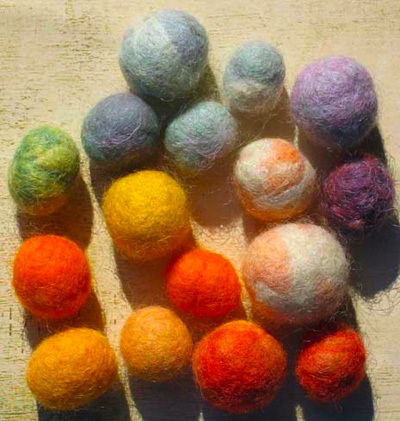 Roll the dry wool loosely into a ball. Pretend you are winding up a ball of yarn, twisting as necessary to keep the shape round. For a layered marble effect, wrap a thin amount of other colors in and over ball. 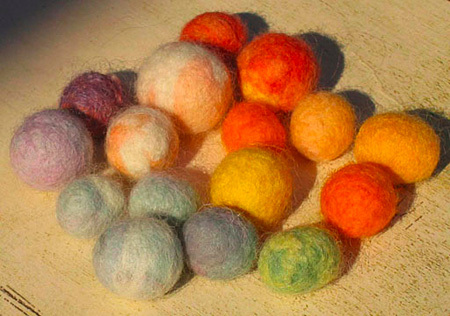 TIP: Wind the wool into a ball evenly for the smoothest results. 3. Dip the ball into the water, and squeeze excess out. 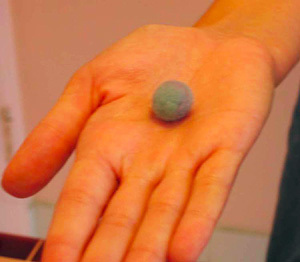 Roll the ball in your soapy hands as you would if you were making a clay ball. You will need to roll for about two to five minutes, depending on the size of your bead. Check occasionally, to ensure your bead is smooth. Resist the urge to squeeze the ball as you roll. 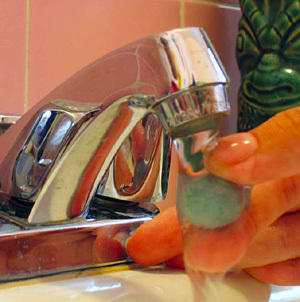 Only squeeze once or twice to remove excess water. You will want to roll with pressure, but trust me, don't. TIP: Roll lightly. If you roll too hard, your ball will get wrinkles and lumps. Do not take this tip casually. You will have better results if you roll as lightly as you would if you were petting a newborn chick. Once the bead starts to feel firmer, you can gradually add pressure as you roll. 4. Once the bead has felted, you can roll as hard as you want. Set aside and make more! When you are finished making beads, place them in a colander in your sink and shock them by pouring boiling water over them. Then, rinse them thoroughly in cold water and set aside to dry. You are done! 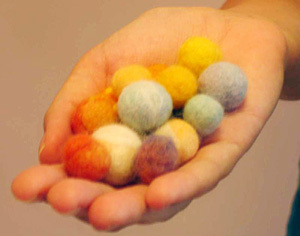 TIP: When you are rinsing the bead, if it takes on water like a sponge and gets sloppy, the bead is not done felting. Go back to step 3 and roll some more. The beads can take a day or two to dry entirely. Be patient, you have to wait until the center is dry to use them. You've read the instructions and have some questions rattling in your mind? Perhaps this will help. What is carded wool and where do I buy it? Carded wool is combed or brushed processed raw or washed fibers used in the production of yarn. Roving is carded wool that has fibers aligned in a straight path. For bead purposes, you can use batts, carded wool or roving interchangeably. You can buy undyed roving and dye your own using instructions found in the dyed in the wool article on knitty. Or you can buy pre-dyed wool too. I have noticed that different breeds of wools felt differently, so be patient. DO NOT BUY SUPERWASH WOOL, it will not felt. You can start with a search for "roving" or "carded wool" on the internet to get countless results. eBay is a good source as well, and I sell felt bead kits in my etsy shop. How do I know when the bead is done? This one is a bit tricky, but the answer is when it's firm. You will get better at knowing this the more beads you make. When you rinse the bead in the final step, it will not swell up and get mushy if it is done. My bead has a crack and/or lump. Can it be saved? Yes! This is a common problem. Just take a tiny amount of fiber and fill the crack or wrap around the problem areas and keep rolling. You may have been rolling with too much pressure. 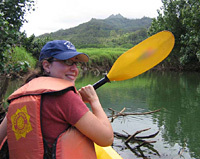 If the bead is a total wreck, don't waste your time trying to save it. It probably won't ever look great. You can always use it as the core of your next bead. Feel free to giggle at the crack in your bead that reminds you of a baby's bottom. I've made a bunch of beads -- how do I string them? A sharp sewing needle will pierce through the bead. Use them like you would any other bead. If you are making very large beads, insert a toothpick through center when still wet. How can I further embellish the beads? There are more ways to do this than I know about. You can embroider on them, stitch seed beads over them, or needle felt designs and textures on them. Try adding in bits of silk or eyelash yarns for texture. Also, experiment with different shaped beads like ovals and cones, etc. The sky's the limit! If these beads aren't your thing, put together a kit with roving and print out these instructions for a pal as a gift, maybe it is just the thing for them. Star Athena is a musician, writer and artist currently living in Los Angeles. Her adventures in knitting and spinning can be found in her blog, Keep on Knitting in the Free World.